Optimizing your site for local search is important in order to be found online by a local audience. Ranking for "near me" searches will become more attainable after following the nine steps explained below. An increasingly important feature for local search is “near me” searches, such as “doctor’s office near me” or “coffee shop near me.” In fact, their popularity doubled in 2015, and they are expected to occur even more frequently over time. If your business plans to optimize for local search, ranking for near me search terms is essential. While no one knows the exact algorithm, emerging research identifies some key factors that influence near me search results. This article walks you through nine steps that will improve local search results for your business. Showing up as a Google Local Business is one way to improve your visibility in Google search. 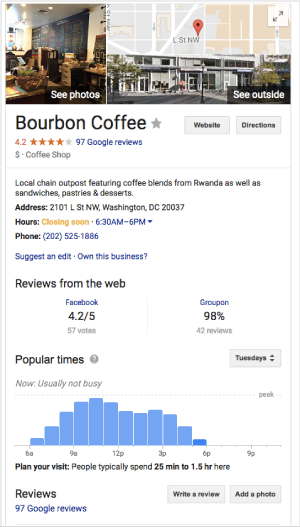 If a user searches, “coffee shop near me” in the DC area, a list of nearby locations will appear at the top of Google. If you click on the first option, “Bourbon Coffee,” a pop-out box that includes information about business hours, phone numbers, and directions appears. 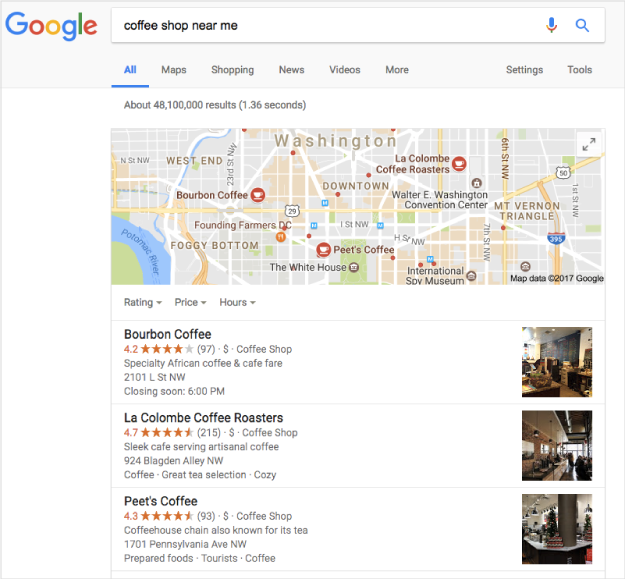 As the Bourbon Coffee example shows, a Google local business listing gives a searcher additional information about your business. 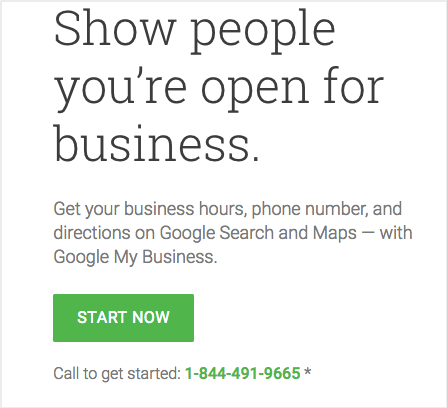 Getting started and/or updating your Google Local Business listing is easy. 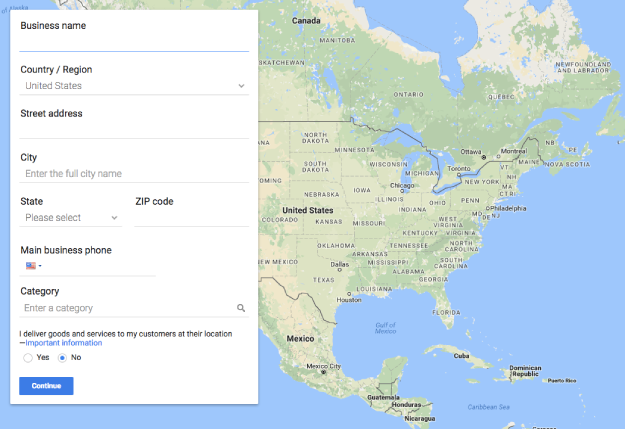 The button will take you to Google Maps and ask questions about your business, including its name, country, address, city, state, zip code, business phone number, and category. One of the most influential factors to impact near me search results are customer reviews. 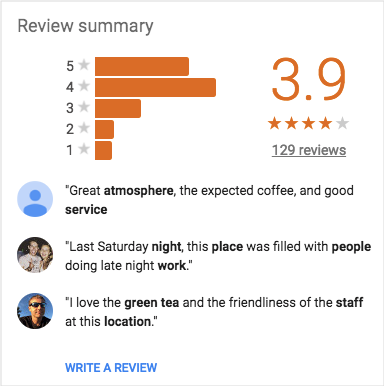 Google makes it easy for customers to review a business. They simply have to open Google Maps, find your business, select “write a review,” and score it out of five stars. Increasing the number of positive reviews users leave can have a dramatic and positive effect on local search. This is especially true when it comes to Google Reviews because unsurprisingly, Google places greater weight on these reviews than on reviews from other sites, such as Yelp. Responding to reviews is another way to improve your local search ranking. It shows that you value your customers and want them to have a good experience. However, if you have unique and compelling customer testimonials published on other sites, you can use the Schema.org markup tool, referred to as Schema, to show search engine results pages (SERPs) that you have non-Google reviews. Schema is code on a web page that describes what the page means. Adding it to your HTML improves how the page is portrayed in search engines. For example, if you use Schema for reviews, when a user searches for your company, a star rating will appear below the listing. Using Schema for reviews improves the chance that Google will show those reviews in SERPs, which will increase click-through-rates to your site and ultimately improve your local search ranking. Clearly showing an accurate business name, address, and phone number is crucial when optimizing your site for local search. Make sure you display your business name, address, and phone number(s) often throughout your website, preferably at the bottom of every page. Use schema markup for this information as well. For example, the schema markup for a local business in LA, Los Angeles SEO Services, includes data, like its address, region, postal code, and country. Updating your schema markup helps Google pick out this information and show it to potential customers. Be consistent with the information you share. Consistency helps Google display the most accurate information for your customers. If you display an incorrect address on a local directory, you risk confusing Google. However, this is a common issue and can be cleaned up manually or with paid services like Yext or Moz Local. The caveat with using a service like this is that once you unsubscribe, your listings will revert to where they previously were. Another option is to use a local listing scan tool, which scans the web to ensure that all your listings are accurate. Another way to show up in local search results is by organizing events and including this information in Schema markup. Active.com uses Schema to feature upcoming road races in a particular location. Updating your schema markup builds your credibility and widens your market by directly showing events within the search results page for your business. Google can also better recommend your business for location-based queries like "events near me." Pictures also seem to influence location-based searches to a noticeable degree. Think carefully when optimizing your pictures. If you're trying to rank higher for a particular place, the location should be one of your target keywords not only in the text you use on your website but also in the file names and tags of every photograph. With the rise of mobile searches over the last five years and Google’s decision to focus on mobile and desktop searches separately, it’s no surprise that your site needs to be optimized for the mobile experience. However, a recent survey shows that 17% of small businesses with websites do not have a mobile friendly version. This oversight is significant, especially since most of these “near me” searches are coming from a mobile device. Another factor that influences near me search results is the number of backlinks to your site that include the city name in the anchor text of the link, according to a study from Local SEO Guide. While any business with a physical site can benefit from ranking for near me searches, multi-location businesses may see an even bigger increase in their overall ranking and traffic. If your business has multiple locations, build a separate page for each location. 180fusion, an SEO firm, created a separate page for its Los Angeles location. The URL clearly shows SERPs where it’s based and what it does: /seo/los-angeles-seo. This step improves your chances of ranking better for location-based queries. It also doesn’t hurt to list each address in the same place on your site as well. While the number one ranking factor for near me searches is likely the proximity of the searcher to the business, there are many actions a webmaster or SEO can do to ensure greater visibility for near me searches. As the near me search trend continues to grow, these efforts should become fundamental to any business site. They can only help in terms of both online visibility and conversion rates. 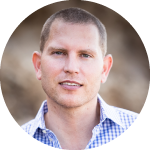 Brad Keys is the Director of Sales & Strategy at 180fusion and assists in creating ROI-focused solutions for enterprise clients. With over a decade of digital experience, Brad has seen the changing landscape and enjoys all things organic and paid with clients at all different stages and aspects of their campaign.